BETHESDA, Maryland, August 29, 2014 (ENS) – Fast-tracked human testing of a vaccine to prevent Ebola virus disease will begin next week by the National Institute of Allergy and Infectious Diseases, NIAID, part of the U.S. National Institutes of Health. The early-stage trial will begin human testing of a vaccine co-developed by NIAID and the British company GlaxoSmithKline. Tests will evaluate the experimental vaccine’s safety and ability to generate an immune system response in healthy adults. Testing will take place at the NIH Clinical Center in Bethesda as the World Health Organizations warns that the deadly virus is likely to spread to more than 20,000 people from the 3,000 people now infected. About half of those infected die of the disease. The Phase 1 clinical trial, called VRC 207, will be led by principal investigator Julie Ledgerwood, D.O., chief of the clinical trials program NIAID’s Vaccine Research Center. The trial will be conducted among 20 healthy adults ages 18 to 50 years. Participants will be divided into two groups of 10 participants each. One group will receive an intramuscular injection of the NIAID/GSK experimental vaccine. The second group will receive a single injection of the same vaccine but at a higher dose. Safety features built into the study’s design include daily and weekly reviews of patient data by clinical staff and the study protocol team. The trial features a staged enrollment plan that requires interim safety reviews after three participants have been vaccinated and have undergone three days of follow up before enrolling additional study participants into the group. Participants in both groups will be seen and evaluated by clinical staff nine times over a 48-week period. The NIAID/GSK Ebola vaccine candidate is based on a type of chimpanzee cold virus, called chimp adenovirus type 3 (ChAd3). The adenovirus is used as a carrier, or vector, to deliver segments of genetic material derived from two Ebola virus species: Zaire Ebola and Sudan Ebola. 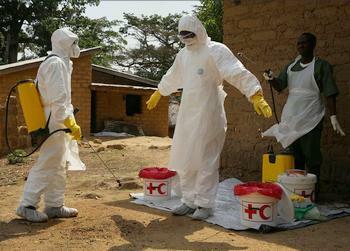 The Zaire species of the virus is responsible for the current Ebola outbreak in West Africa. The vaccine candidate delivers one part of Ebola’s genetic material to human cells, but the adenovirus vector does not replicate. Instead, the Ebola gene that it carries allows the cells of the vaccine recipient to express a single Ebola protein, and that protein prompts an immune response in the individual. It is important to know that the Ebola genetic material contained in the investigational vaccine cannot cause a vaccinated individual to become infected with Ebola. “The experimental NIAID/GSK vaccine performed extremely well in protecting nonhuman primates from Ebola infection,” Dr. Fauci observed. NIAID will also test a version of the NIAID/GSK vaccine that contains genetic material from only the Zaire Ebola species. This portion of the Phase 1 safety study, which will also involve 20 healthy adults, is expected to begin in October at the NIH Clinical Center and potentially another U.S. location. Dr. Ledgerwood will also lead that effort. The VRC 207 clinical trial is being conducted based on expedited review and approval by the U.S. Food and Drug Administration. The study is the first of several Phase 1 clinical trials that will examine the investigational NIAID/GSK Ebola vaccine and an experimental Ebola vaccine developed by the Public Health Agency of Canada and licensed to NewLink Genetics Corp. In parallel, NIH has partnered with a British-based international consortium that includes the Wellcome Trust and Britain’s Medical Research Council and Department for International Development that plans to test the NIAID/GSK vaccine candidate among healthy volunteers in the United Kingdom and in the West African countries of Mali and Gambia. In addition, the U.S. Centers for Disease Control and Prevention has initiated discussions with Ministry of Health officials in Nigeria about the prospects for conducting a Phase 1 safety study of the vaccine among healthy adults in that country. The pace of human safety testing for experimental Ebola vaccines has been expedited in response to the ongoing Ebola virus outbreak in West Africa. According to the World Health Organization, WHO, more than 1,400 suspected and confirmed deaths from Ebola infection have been reported in Guinea, Liberia, Nigeria, and Sierra Leone since the outbreak was first reported in March 2014. The investigational vaccine now entering Phase 1 trials was designed by Nancy Sullivan, PhD, chief of the Biodefense Research Section in NIAID’s Vaccine Research Center. She worked in collaboration with researchers at the VRC, the U.S. Army Medical Research Institute of Infectious Diseases, and Okairos, a Swiss-Italian biotechnology company acquired by GSK in 2013. Phase 1 clinical trials are the first step in what is typically a multi-stage clinical trials process. During Phase 1 studies, researchers test an investigational vaccine in a small group of people to evaluate its safety and the immune response it provokes. Phase 2 clinical trials of investigational vaccines are designed to further assess safety and immune response in larger numbers of volunteers. Under certain circumstances, the vaccine’s ability to prevent infection or disease can be determined in a Phase 2 trial. Phase 3 clinical trials are directed predominantly at determining efficacy. The candidate vaccine builds upon three earlier NIAID-developed investigational Ebola vaccines that began Phase 1 clinical trial testing in 2003. “The knowledge gained from each of those trials has contributed to the development of the candidate vaccine we are now studying, as well as our improved understanding of human immune responses to investigational Ebola vaccines,” said Dr. John Mascola, director of NIAID’s Vaccine Research Center. In parallel, the National Institutes of Health has partnered with an international consortium that includes the British-based Wellcome Trust, as well as Britain’s Medical Research Council and Department for International Development to test the same NIAID/GSK monovalent vaccine candidate. The vaccine candidate will be tested among 60 healthy volunteers at the University of Oxford in England and among 40 healthy volunteers in Mali by the University of Maryland School of Medicine Center for Vaccine Development and its Center for Vaccine Development in Mali. Additionally, the vaccine candidate is expected to be tested among 40 healthy volunteers in Gambia after approval from the relevant authorities. The Oxford trial is expected to launch in mid-September pending ethical and regulatory approval. “Today’s announcement shows how private and public partners can pull together to quickly respond to this critical public health emergency. Developing a new vaccine is complex with no guarantees of success, and we are still in the early days for our Ebola vaccine candidate. But we are encouraged by progress so far and will do the best we can, along with WHO and our partners, to speed up development and explore ways in which the vaccine could contribute to this or future Ebola outbreaks,” said Dr. Moncef Slaoui, chairman of Global R&D and Vaccines at GSK. Initial safety and immunogenicity data from the Phase 1 trials of the NIAID/GSK investigational Ebola vaccine are expected in late 2014. The NIH will also collaborate with the U.S. Department of Defense in support of efforts by NewLink Genetics Corp., a biopharmaceutical company in Ames, Iowa, to conduct Phase 1 safety studies of the investigational recombinant vesicular stomatitis virus Ebola vaccine (called VSV-EBOV) developed by and licensed from the Public Health Agency of Canada. Those clinical trials are expected to begin in the fall at the Clinical Trials Center of Walter Reed Army Institute of Research in Silver Spring, Maryland.